The sun is finally out on a regular, non bi-polar, basis here in the Yakima Valley and I’m really happy about it. This past weekend, I took my sisters downtown to enjoy the Cinco de Mayo festivities. I recently purchased these lace-up sandals from TJMaxx and needed to show them off ASAP! You know that feeling when you stumble across the loveliest pair of shoes that you don’t know what you’ll pair them with, but you must have them? That was my Carrie Bradshaw moment with these Steve Madden sandals. I have nothing like them in my closet, so I knew I wouldn’t be cluttering my wardrobe with the same look. Plus, girl, they were under $30. I mean, really. I hope you enjoy this post. Scroll all the way through and you will find the links to shop. I normally have a wide foot, so I was a little worried that these would only cover half of each one. To my surprise, not only are they comfortable, but the fringe trim on the front and the tassels are genuine leather. If I am going to wear sandals all summer long, genuine leather is a must to ensure longevity. Even if the leather patinas darker later on, I am still going to get great wear out of them. I paired them with white denim, also from TJMaxx. These are by a brand called D Jeans. Obscure. Don’t care because they’re a great fit, and honestly, make my booty look good! I rolled up the hem to show off the lace-up straps, naturally. 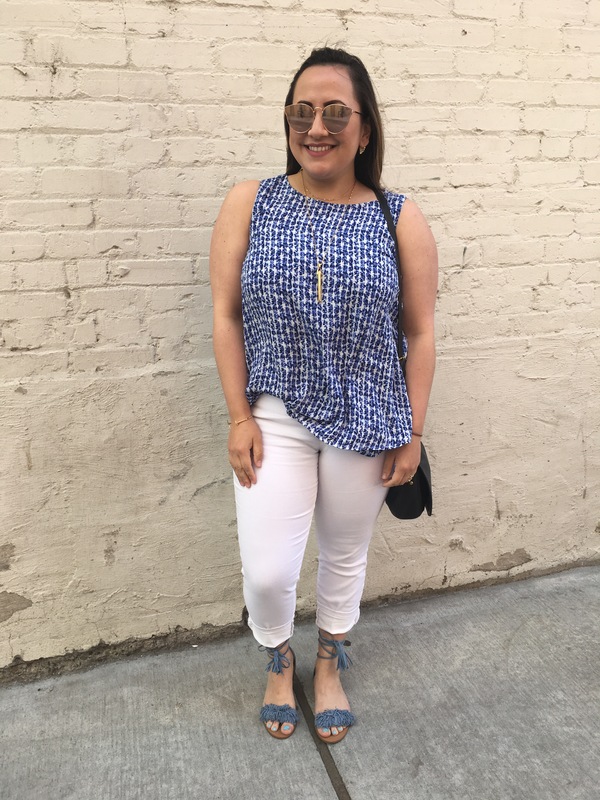 For the rest of the outfit, I wore my double-layer blue & white tank from Chico’s. It was hot this past Sunday, so even though the tank is a dual-layer piece, it’s very breathable and comfortable. I paired it with my Fossil cross-body and gold Stella & Dot pieces to match the gold hardware. Tank: I love this classic one. Denim: This pair fits fantastic! Sandals: May still be at your local TJ Maxx, but this Steve Madden pair is similar. Crossbody bag: This one comes in 9 other colors! Celestial Ring: You can shop this staple piece here. Quay Sunnies: You all know I’m obsessed with these.